Washington Square Press, 9780743267281, 318pp. On a frosty day in February 1862, hundreds gathered to watch the execution of Nathaniel Gordon. Two years earlier, Gordon had taken Africans in chains from the Congo -- a hanging offense for more than forty years that no one had ever enforced. But with the country embroiled in a civil war and Abraham Lincoln at the helm, a sea change was taking place. Gordon, in the wrong place at the wrong time, got caught up in the wave. 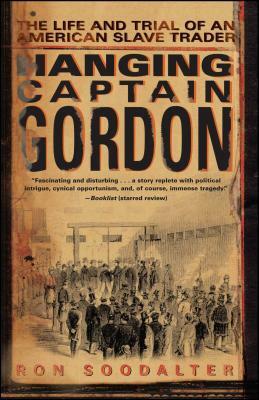 For the first time, Hanging Captain Gordon chronicles the trial and execution of the only man in history to face conviction for slave trading -- exploring the many compelling issues and circumstances that led to one man paying the price for a crime committed by many. Filled with sharply drawn characters, Soodalter's vivid account sheds light on one of the more shameful aspects of our history and provides a link to similar crimes against humanity still practiced today.